Bronze Guide-Liners were introduced to the market over 40 years ago as a practical, accurate and efficient way to repair worn valve guide bores. The material properties combined with their unique construction and manufacture still offers exceptional performance even in today’s modern and high performance engines. The Guide-Liners are made of spring tempered phosphor bronze. This material offers anti-seizing, anti-wear properties and a high strength-to-weight ratio. It is more dense than cast iron and has a higher rate of thermal conductivity and lower rate of friction. This ensures cooler running and improved economy. 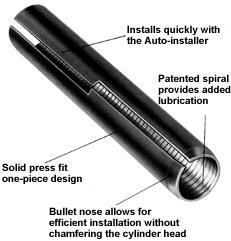 Some bronze liners offer a unique design, for example K-Line Bronze Bullet®, which feature an interrupted spiral in the inner bore. The inner grooves do not align at the seam. This ensures that oil is contained within the bore aiding lubrication and enhancing wear characteristics but also reduces the possibility of excessive oil consumption. Over the years, various tests in conjunction with major engine builders and OEMs. have shown that bronze liners out perform cast iron guides. In fact, some tests have shown bronze liners to be as much as three times more durable than cast iron. 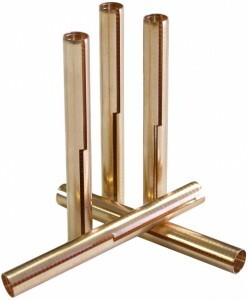 Virtually any cylinder head can benefit from the fitting of bronze valve guide liners. 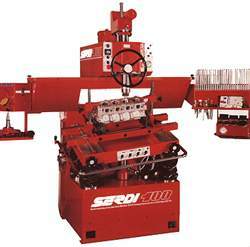 The process involves the reaming out of the original valve guide bore using our Serdi 100 machining centre before fitting a thin wall bronze sleeve. The sleeve is then sized extremely accurately using a roller burnisher. HT Howard’s use of this special tool allows the guide to be finished to extremely close tolerances for increased accuracy over other methods. This operation takes place in several stages, gradually increasing the guide bore size until the valve just enters the guide. Once sized, the guide liner is trimmed to match the length of the original guide. Finally, the guide bore is honed exactly to the required size and to give the best internal finish for oil retention. High quality valve guide repair, and upgrades can be achieved for almost any engine. What does all this mean for your Cylinder Head? There will be instances when it is better to avoid removing the existing valve guides. These include many older engines where heads are old, rare or delicate in which removal may result in damage to the casting. This is especially common where guides may have been previously replaced and removal can expose hidden problems such as oversize housings etc. As long as the existing guides remain tight in the casting bronze guide lining offers an exceptional and reliable repair. Many engines feature non replaceable valve guides where the guide bore is machined through the parent cylinder head material. These “cast in” guides are easily repaired with the guide liner system. From experience, we have noted that many replacement valve guides from even reputable specialist suppliers leave a lot to be desired. Many customers have supplied us with parts which, when fitted, have been as bad as those removed which had endured a lifetime of work in an engine. This is unacceptable and a waste of time and money. Our guide lining system allows us to tailor every valve guide bore extremely accurately to the valve stem size so achieving minimum clearances. When converting older engines to run on unleaded fuels it can be necessary to actually increase valve to guide clearances when using original equipment type guides to prevent the valves seizing in the guides. This occurs when the natural lubrication properties present in the leaded fuel are removed. The anti-seize properties of the bronze material in thin wall guide liners enables H T Howard to significantly reduce these clearances. Typically, original engines of this type run exhaust valve/guide clearances of 0.0015” with up to 0.0020” not uncommon. We have successfully reduced this to as little as 0.0006” with no ill effect. The resulting reduction in oil consumption and better emissions are an added bonus. Special tooling allows us to restore even bronze valve guides found in many high performance engines. We routinely use the system in the repair of cylinder heads from “high end” vehicles such as Porsche, Cosworth, Rolls Royce, BMW and Mercedes as well as heads used in racing applications. This offers all the benefits associated with exceptional machining quality at a lower cost than replacing the original guides. Higher degrees of accuracy in the taper and ovality of the guide bore enables more accurate valve seat machining and improved valve sealing. In engines containing rockers, their movement on the tip of the valve puts lateral forces on the guide resulting in ovality which forces the head of the valve out of alignment with the valve seat. This causes poor sealing with resulting loses in compression and efficiency. Tighter clearances minimise this making for the longest lasting repair. Engines running on unleaded petrol, (or in extreme conditions), experience higher cylinder head temperatures. The bronze material combined with less clearance allows better heat transfer away from the valve resulting in cooler running and improved economy. Reducing clearances between valve and guide means that less oil is drawn down into the combustion chamber which improves emissions and reduces oil consumption.